In its letter to the European Parliament, the leading international human rights NGO highlights the need for an opinion of the EU Court of Justice on applying the EU-Morocco Fisheries Agreement to a territory that is under occupation. "It remains the case, factually, that Morocco is in occupation of the territory and therefore the relevant international humanitarian law applies", concludes the letter that Human Rights Watch sent out to all Members of the European Parliament (MEPs) this morning. In the letter, the NGO expresses its concerns that the proposed EU-Morocco Sustainable Fisheries Partnership Agreement - that includes the waters of Western Sahara in its geographical scope - "fails to meet the requirements of international law, and in particular of international humanitarian law (IHL), and therefore calls on you to seek an opinion from the European Court of Justice (ECJ) on the compatibility with the European Treaties, and specifically with international humanitarian law governing occupied territories, of the proposed SFPA". Human Rights Watch refers to the consecutive EU Court rulings pertaining to EU-Morocco agreements being applied to Western Sahara, which are based on the status of the territory as a Non-Self-Governing Territory whose people have a right to self-determination. "In the ECJ's self-determination framework, the people of Western Sahara must provide their consent before the EU may enter into agreements with Morocco on the utilization of those resources." But the NGO is also adamant that international humanitarian law (IHL) must also apply, as, they argue, "the relationship between Morocco and Western Sahara is also one of occupation". "In practice, in order for Morocco, as an occupying power, to lawfully exploit Western Sahara's resources, it would have to establish a fund with transparent bookkeeping that shows the resources utilized or exported, the revenue derived, and the channeling of those resources to the sole benefit of the people of Western Sahara". A reference to the Development Fund of Iraq established in 2003 is included for inspiration. Read Human Rights Watch's full letter to the European Parliament here or further below. A proposal to refer the SFPA to the ECJ for an advisory opinion was put forth by a group of 110 MEPs last week, and is on the agenda of tomorrow's plenary session. On February 12, 2019, the European Parliament is scheduled to vote on a legislative resolution on the draft Council decision on the conclusion of the Sustainable Fisheries Partnership Agreement (SFPA) between the European Union and the Kingdom of Morocco, the Implementation Protocol thereto and the exchange of letters accompanying the Agreement. On January 16, the Parliament approved related legislation governing trade in agricultural goods, the EU-Morocco Agreement on the amendment of Protocols 1 and 4 to the Euro-Mediterranean Agreement. Human Rights Watch is concerned that the SFPA fails to meet the requirements of international law, and in particular of international humanitarian law (IHL), and therefore calls on you to seek an opinion from the European Court of Justice (ECJ) on the compatibility with the European Treaties, and specifically with international humanitarian law governing occupied territories, of the proposed SFPA and of the EU-Morocco Agreement on the amendment of Protocols 1 and 4, pursuant to Article 218.11 of the Treaty on the Functioning of the European Union. Specifically, in its judgment (Case C-104/16 P) of December 21, 2016, the court determined that the 2012 “Agreement between the EU and Morocco concerning reciprocal liberalisation measures on agricultural products and fishery products” provided no legal basis for including Western Sahara within its territorial scope. With an eye toward complying with the court’s ruling, the European External Action Service (EEAS) and the European Commission conducted a process of consultation in Rabat and Brussels with elements of the population of Western Sahara and with other interested parties, and the European Parliament conducted its own fact-finding visit to the territory on September 3-4, 2018. The European Parliament resolution adopted in January 2019 on the EU-Moroccan Agreement claims that during this consultation, “majority support was expressed, by the parties participating, for the socio-economic benefits the proposed tariff preferences would bring.” (Paragraph 11). It states, “[A]ll reasonable and feasible steps have been taken to inquire about the consent of the population concerned, through these inclusive consultations” (Paragraph 8), while also claiming that because “the [ECJ] did not specify in its judgment how the people’s consent has to be expressed… some uncertainty remains as regards this criterion” (Paragraph 12). The resolution nevertheless claims, in urging adoption, “that this agreement does not imply any form of recognition of Morocco’s sovereignty over Western Sahara.” (Paragraph 5). Human Rights Watch is not in a position to determine whether the consultative process conducted by the EU institutions complies with the ECJ’s requirement of obtaining “consent” and whether the parties that the EU institutions consulted meet the court’s definition of “the people of Western Sahara.” However, we are concerned that the agreement falls well short of Morocco’s obligations pertaining to occupied territories under international humanitarian law. The ECJ ruling rejecting the applicability of EU-Moroccan agreements to Western Sahara is based on viewing Western Sahara as a Non-Self-Governing Territory whose people have the right to self-determination. However, the relationship between Morocco and Western Sahara is also one of occupation and, as such, treaties affecting the territory must comply also with IHL. The two legal frameworks share fundamental principles in underscoring that the resources of the territory in question belong to the people of that territory, and that stringent standards apply to a third party’s disposal of those resources. In the ECJ’s self-determination framework, the people of Western Sahara must provide their consent before the EU may enter into agreements with Morocco on the utilization of those resources. In the IHL framework, the exploitation of occupied territory may be carried out only for the benefit of the occupied population (Article 55 of the Hague Regulations of 1907). In practice, in order for Morocco, as an occupying power, to lawfully exploit Western Sahara’s resources, it would have to establish a fund with transparent bookkeeping that shows the resources utilized or exported, the revenue derived, and the channeling of those revenues to the sole benefit of the people of Western Sahara. The Development Fund of Iraq, established by United Nations Security Council resolution 1483 soon after the United States-led coalition forces occupied Iraq in April 2003, is an example of such a mechanism that was structured to comply with IHL, despite deficiencies in its implementation. The Fund was held by the Central Bank of Iraq and independently audited by accountants approved by the International Advisory and Monitoring Board. Most significantly, the revenue collected could be used solely to benefit of the people of Iraq. No comparable mechanism exists with regard to resources of Western Sahara and the proposed agreement does not envision the establishment of one. 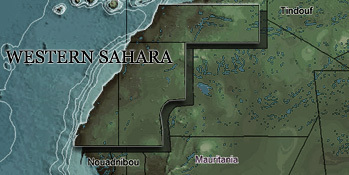 As regards the expression ‘waters falling within the … jurisdiction of the Kingdom of Morocco’ in that provision, the Council and the Commission considered, among a number of possibilities, that the Kingdom of Morocco might be regarded as a ‘de facto administrative power’ or as an occupying power of the territory of Western Sahara and that such a description could be of relevance in order to determine the scope of the Fisheries Partnership Agreement [of May 22, 2006]. The Court held that there was no point in considering whether either of these two frameworks, as an expression of the “joint intention of the parties” to the Fisheries Partnership Agreement … “would have been compatible with the rules of international law that are binding on the European Union” since “the Kingdom of Morocco has categorically denied that it is an occupying power or an administrative power with respect to the territory of Western Sahara….It follows from all the foregoing that the waters adjacent to the territory of Western Sahara are not covered by the expression ‘waters falling within the sovereignty or jurisdiction of the Kingdom of Morocco’, in Article 2(a) of the Fisheries Partnership Agreement” (Paragraphs 72 and 73). However, it remains the case, factually, that Morocco is in occupation of the territory and therefore the relevant international humanitarian law applies. In light of this affirmation, and the concerns outlined in this letter, Human Rights Watch urges you to ensure that any EU agreement with Morocco respects the rights of the people of Western Sahara and does not contribute to violations of international humanitarian and human rights law. We call on you to adopt a resolution requesting an opinion from the Court of Justice on the compatibility of the SFPA and the agreement on the Amendment of Protocols 1 and 4 with the EU Treaties and specifically with international humanitarian law. I thank you for your attention and consideration to this urgent matter.